Access to your iTunes video library from anywhere in the world. Is there a better alternative to Expanse? Is Expanse really the best app in Entertainment category? Will Expanse work good on macOS 10.13.4? Expanse is a Web server to access your iTunes video library, allowing you to watch your videos from anywhere in the world. It also creates video podcasts using your iTunes library as a source of movies and TV shows. Expanse needs a review. Be the first to review this app and get the discussion started! Expanse needs a rating. Be the first to rate this app and get the discussion started! Accessibility of your collection. Expanse is essentially a Web server which allows you, using an ordinary Internet browser and Expanse' elegant Web interface, to see a list and a description of your movies and TV shows, and to watch the video. 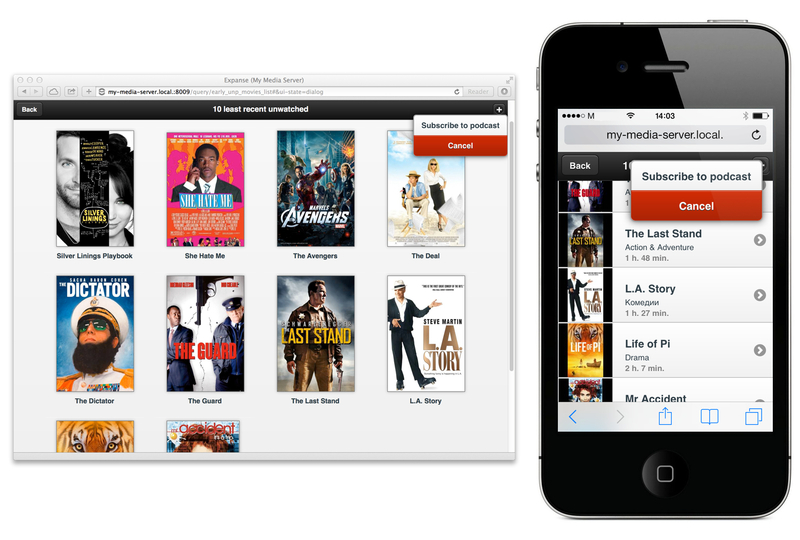 Thus your iTunes video collection is available on any device with support for HTML5. You can also subscribe to podcasts on any gadget where is an application such as podcatcher. It can be Android or Windows device, or even another computer. Access from Internet. You can to toggle Expanse into its "Local network and Internet" mode, and your video collection will be available on the Internet through web-interface or podcasts. You can update podcasts on your gadget, watch online, or download movies from your collection while sitting in a cafe or at work, not only at home.